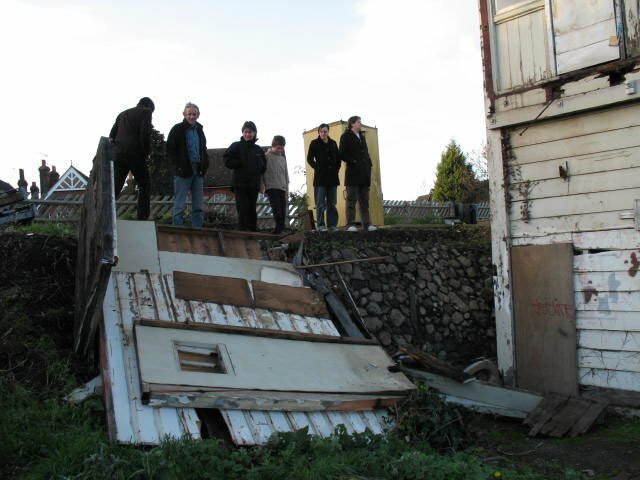 3 December 2006 - Force 8 gales and storms overnight on 2 December destroy the toilet block. Fortunately the toilet fell away from the railway line and the fence to the track was undamaged. The damage was surveyed on 3rd December and we appear to have been very fortunate in that the signal box itself is unscathed. Click to see us checking the damage. 30 September 2006 - The Esmée Fairbairn Foundation have awarded a grant of £15,000 to the Trust. We are extremely grateful for this support which has come at a crucial stage in the project. 9/10 September 2006 - Heritage Open Days were a huge success with over 300 visitors. 24 volunteers ensured that a warm welcome was extended to all of the visitors and they were entertained and informed about signal boxes in general - and this one in particular. A huge vote of thanks to the volunteers for making it possible and to the visitors for making it worthwhile. 11 June 2006 - Incredible heat made this an incredible day! The huge pile of brambles weeds and assorted wooden debris has been turned into wood chippings for the garden. The bank has been cleared further and we filled another skip with rubbish. Inside the box, Andy has started getting the glass out of the lever frame. 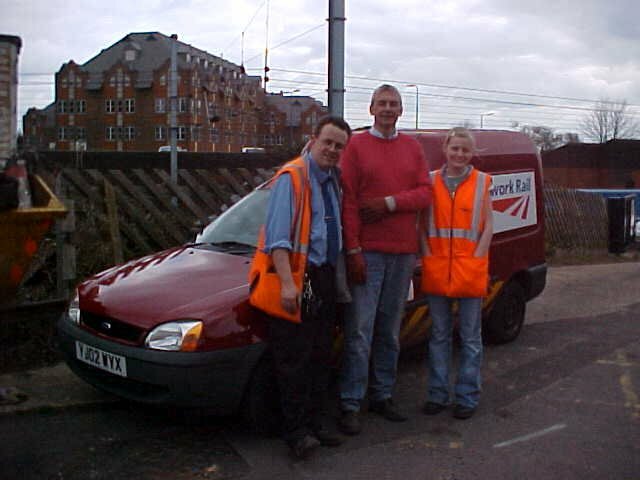 13/14 May 2006 - Some more amazing working days! Again, thanks to all who took part. Special mention is due to Emma who now has a part of the retaining wall and bank named 'Emma's bank!' after a huge clearance effort. 9 April 2006 - A fantastic working day! Many thanks to all who took part. 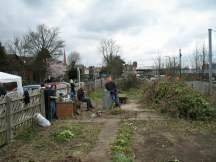 A huge amount of clearing up was accomplished by volunteers and a special thank you to the lineside team provided by Network Rail. They were a huge help and undertook most of the heavy work on the garden with their strimmers and chainsaws. A marvelous effort by all concerned! Robin Morel and Emma Bulmer from Network Rail with the Trust's Chairman, plus a before and after view. 6 April 2006 - Asbestos and Caustic Soda batteries have been removed from the box by Veolia ES Onyx Ltd. The Hazardous waste was of such a large quantity that we had to register the property with the Environment Agency. Our thanks go to Veolia for their prompt and courteous help with this. 23 March 2006 - The AGM was held at the County Constitutional club. A large number of Trust members were present and were heartened by all the good news. The accounts were presented, and the treasurers report was once seen here. 7 March 2006 - The LEASE IS SIGNED. After many years of effort the lease is signed and we are now the happy custodians of the St Albans South Signal Box. Much work lies ahead - and we look forward to continued support from our friends and neighbours to turn the derelict eyesore into a proud addition to the Heritage of St Albans.